Time for my reveal..... I had a sea kit pictured above. I added a mix of seed beads from my stash and strung them all on reclaimed copper wire from "scraps" that were being thrown out from a rewiring job at my day job. I like the mix of colors, but really had quite the time incorporating the metal pieces included in my kit-- I'm still not sure if I really like it or not- it just isn't quite my style I guess...but all things considered, I think I did a pretty ok job of combining everything and used everything from my kit.... what do you think???? On a side note, I don't know if I'm the last person to learn of your struggle since your accident last December... I just wanted you to know you can add me to the list of folks praying for your full return to health, Annette. I'm gonna keep that one close to my heart! I love how you used copper with the blues and greens...it makes quite a statement! Love it! Great job on this piece Annette! Stay strong ! I love it Annette. :) You did an awesome job with all of those beads. GREAT JOB, you really packed it all in to that necklace and it came out beautifully! I love the copper with blues and greens. Nice job! Love how your necklace turned out, hope you will be feeling better soon. I love how you incorporated all the beads. The necklace is lovely. Your piece looks beautiful. Kudos for using up all your pieces. I have a few pieces left. I think I'll make a pair of earrings with my left overs. I thought I recognized those metal pieces! ha! I think you made very creative use of them! And I love what you did with your beads! Best wishes to you! This sand-and-sea hop just introduced to your blog, and am so sorry to read about your accident... I am impressed that you were able to make a necklace so lovely, considering how things have been going. I know I'm just another face on the internet, but you are definitely in my thoughts and prayers! I hope that things start looking up for you! You did a great job of bring all the beads together. What a great necklace! I love the copper components in the necklace. 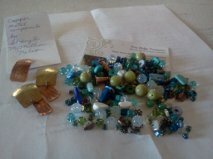 I love the combination of copper with the blues and greens -- it's a great match! Love the necklace!